If you’re like me, it’s Friday morning and all you can think about is all the good food you need to make time to eat over the weekend. Now I’m the first one to say that I’m not a vegan, but I absolutely love the eco-friendly and uber stylish UES cafe Candle 79. Serving fresh farm-to-table food, organic wine/cocktails and a prix-fixe brunch, what more could you ask for? It’s also not one of those vegan restaurants that only serves vegetables – Candle 79 has a great selection of different proteins that are innovatively (and healthily) prepared, such as the Seitan Piccata with Creamed Spinach, or the Cornmeal-Crusted Tofu Medallions. My pick? 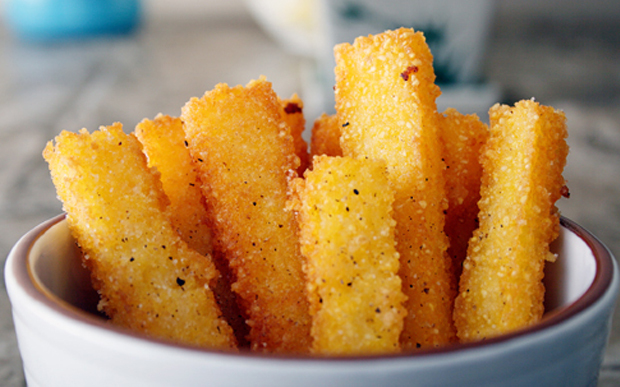 I’ve always been a fan of French fries and Candle 79’s fresh take on polenta will leave you begging for more. Photo courtesy of Mid West Veg.